Situated at the north end of Mobile Bay in southwestern Alabama, Mobile – The Port City, is home to 195,111 residents per the 2010 census. The metropolitan area includes portions of the Eastern Shore, including the Baldwin County cities of Daphne, Fairhope and Spanish Fort. 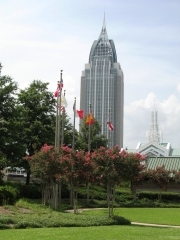 Staples in the local economy include shipbuilding industries along the Mobile River, several medical centers, the Alabama State Docks and the University of South Alabama (USA). 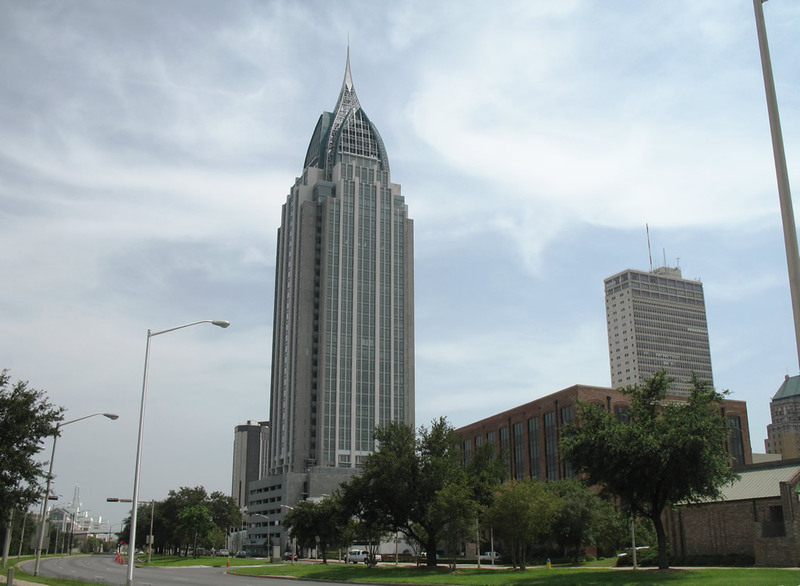 A regional service center, Mobile is the largest city on the upper Gulf Coast east of New Orleans. 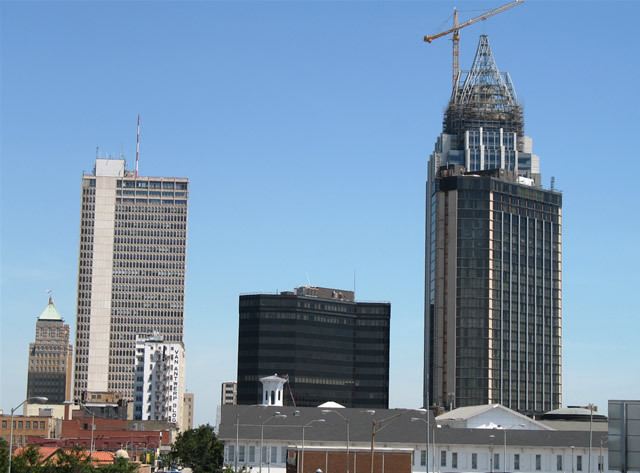 The 2010 Census lists the population of the Mobile metropolitan area at 412,992, making it the third largest within the state of Alabama following Birmingham and Huntsville. The Mobile metro area ranks as the fifth most populous along the Gulf of Mexico following Houston, Tampa, New Orleans and Baton Rouge. 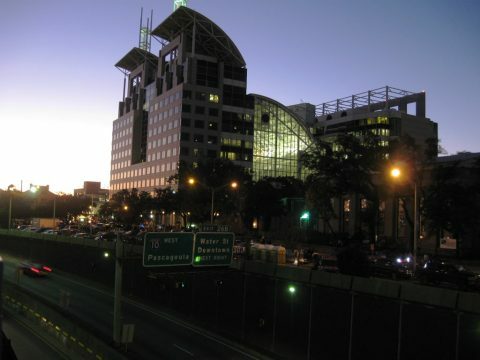 The RSA-BankTrust Building, RSA Battle House Tower and the Renaissance Riverview Plaza Hotel rise to the north of Fort Condé and Interstate 10. Photo taken 02/06/09. 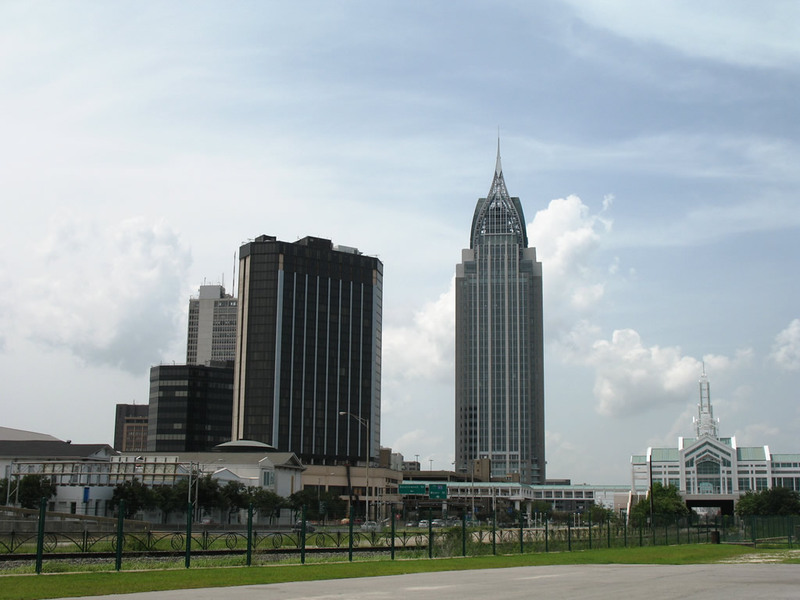 Area points of interest in Mobile include the USS Alabama, Bellingrath Gardens, Fort Gaines, and the Gulf Coast Exploreum Science Center in Downtown Mobile featuring art and cultural exhibits and an IMAX theater. The Port City is also the original home of Mardi Gras. Mardi Gras in Mobile lasts approximately two and half weeks and culminates with the arrival of Lent. Festivities include both day and night parades in Downtown throughout the Mardi Gras season. Parades consist of live bands, decorative floats in which revelers toss out trinkets to the crowds (known as throws), and various marching bands from throughout the state and region. Throws in Mobile range from beads, whistles, moon pies, stuffed animals, bracelets, candy, toys and doubloons (coins of the Mardi Organization conducting the parade). The celebration continues each night after the last parade with a ball hosted by the Mardi Gras organization of the day. 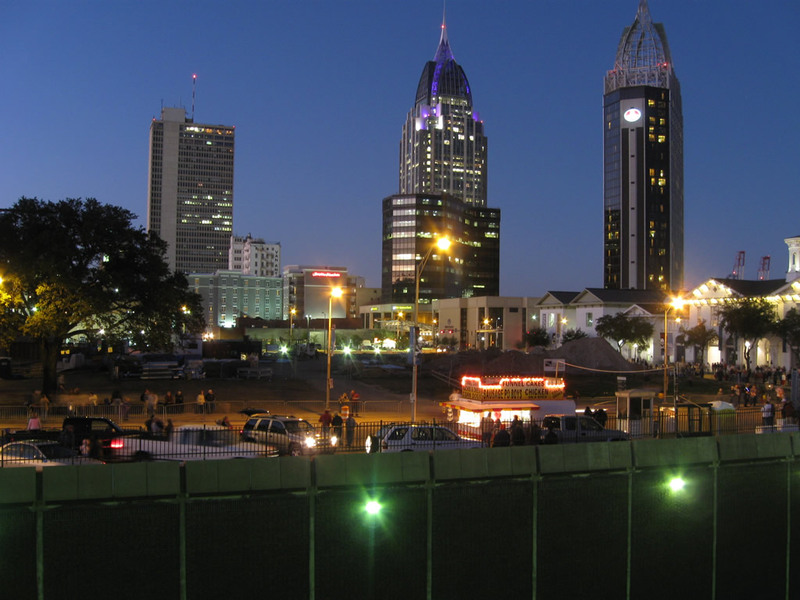 Offering food, drinks, live music and dancing, the balls are also held Downtown in the Mobile Civic Center. 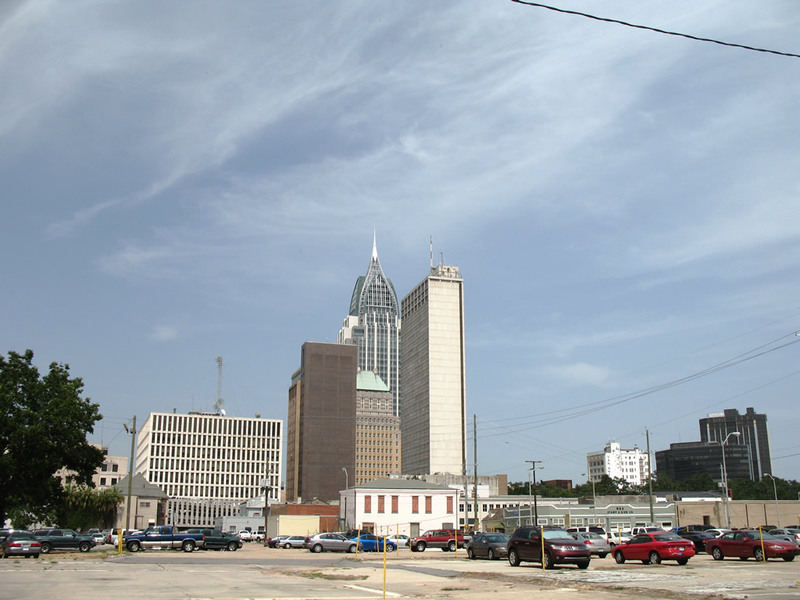 Looking southeast toward Downtown Mobile from an area near the intersection of Joachim and St. Michael Streets. Photo taken July 18, 2007. 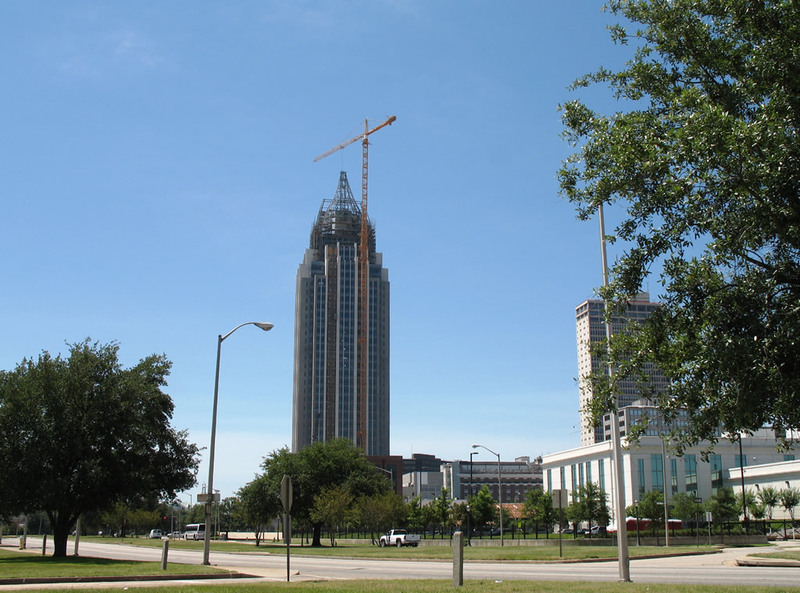 Mobile Government Plaza rises above the Interstate 10 exit from the George Wallace Tunnel on February 2, 2009. 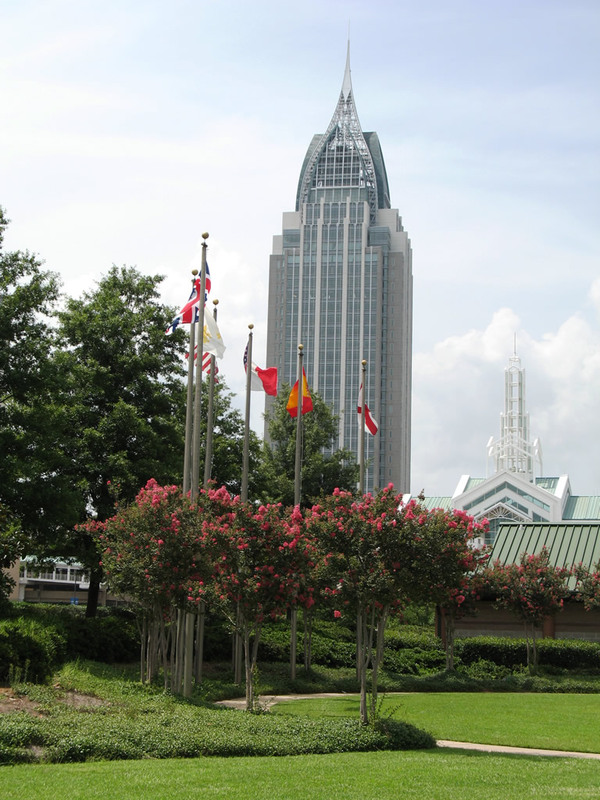 The city is also home to the Southern League Double A Baseball team, the Mobile Baybears. 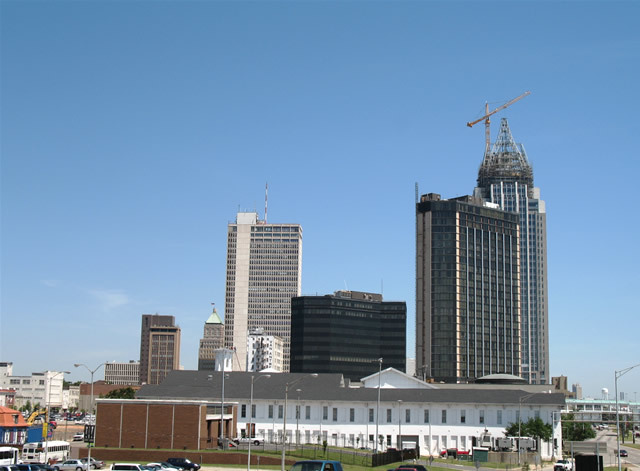 Previously the city hosted the Mobile Mystics Minor League hockey franchise, folded in 2001, and the Mobile Revelers NBDL basketball franchise in 2003. 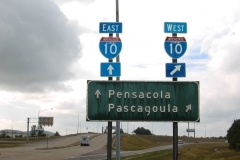 Interstate 10 travels 66.30 miles across Mobile and Baldwin Counties as part of its route across the upper Gulf Coast between Biloxi/Gulfport, Mississippi and Pensacola. The freeway enters Alabama near Grand Bay, traveling east as a rural four-lane freeway through to Theodore and southwestern reaches of Mobile. A six-ramp parclo interchange opened to traffic along Interstate 10 at McDonald Road on January 12, 2005. Numbered Exit 10, the exchange links I-10 with County Road 39 north to west Mobile and south to U.S. 90 at Irvington, and Half Mile Road to Bayou La Batre. The new four-lane highway for CR 39 was completed in June 2009. Widening of I-10 to six lanes was completed from Carol Plantation Road east to SR 193 (Exit 17) by fall 2014. Continuing east from Tillmans Corner, commuter traffic adds to I-10 through to the south end of Interstate 65. 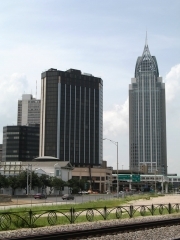 The urban freeway maintains six overall lanes, with auxiliary lanes accompanying both directions of the route through Mobile. Back to back lane drops occur along Interstate 10 eastbound at the Canal Street off-ramp and Water Street interchange south of Downtown, as the freeway lowers into the George Wallace Tunnel below the Mobile River. Regular congestion occurs at the tunnel due to the steep descent and merging traffic from the Water Street on-ramp. An interim measure was implemented on June 24, 2017, when the Water Street on-ramp was closed to traffic. Emerging from the four-lane Wallace Tunnel, Interstate 10 ascends onto the Mobile Bayway. Also known as Jubilee Parkway, the Bayway spans the shallow waters of Mobile Bay along a viaduct system extending eight miles east to Spanish Fort and the Baldwin County Eastern Shore. U.S. 90 & 98 parallel the four-lane freeway along Battleship Parkway, a causeway just a few feet above sea level, nearby. Variable speed limits are used throughout the Mobile Bayway. Changeable speed limits coincide with a fog detection system implemented along the viaduct following the events of March 20, 1995. Dense fog that day resulted in a 100 plus vehicle pile up, killing one and seriously injuring six. Speed limits are reduced both due to fog or road construction, and are otherwise set at 65 miles per hour east of the Wallace Tunnel, and at 55 miles per hour leading into the tunnel. Future construction will both expand the Mobile Bayway to eight overall lanes, and bypass the Wallace Tunnel with a new 215 feet high cable-stayed bridge accommodating six lanes of traffic. Planning for the new Mobile River Bridge dates back to at least 2001, but funding issues and opposition pushed back progress for over a decade. The west end of the approach span begins between Virginia St and Texas St, and rises on a 4% grade. It begins parallel to, and outside of, the existing I-10 lanes here. Near the Water St exit, it curves to the right as it continues its ascent. In fact, the EB approach span will go directly over the EB off-ramp to Water St for a short ways. The main span is 1250′ long, with a minimum clearance of 190′ (commented by one official at the hearing to be the second highest clearance in the US across a navigable channel). Of the two main bridge piers, one will be on land off the west side of the river, while the other is in the river, near the eastern side. The cables will stretch 475′ west of, and 575′ east of, the main piers (asymmetrical due to the Water St. interchange). East of the main span, the bridge takes two curves to the right, separated by a short straight stretch, coming down on another 4% grade, and ends in the median of the “Bayway”, roughly even with the entrance to the USS Alabama battleship park. The bridge is built primarily with I-10 through traffic in mind (which comprises 60% of overall I-10 traffic in the area, based on traffic studies). Existing I-10, including the Water St and Bankhead interchanges, as well as the Wallace Tunnel, will remain open, and will serve traffic heading to downtown. No clue yet as to what each route will be signed as. On the western (Mobile) side, there’ll be some ramp/lane changes. The EB on-ramp from Broad St will be widened to 2 lanes…which, in conjunction with a 5th EB lane that begins just east of the Broad St overpass, will give 7 lanes on the EB approach to the bridge/downtown split. Four lanes will continue to downtown, as is the case today, while the right three lanes split off for the bridge. Westbound, instead of having seven lanes merge into four in a short space (about 1/2 mile), the proposal is to taper off the lanes coming from downtown, one at a time, prior to and at the downtown/bridge merge, in order to minimize the potential bottleneck. The actual gore in both directions will be just north(east) of Texas St. Also, the ramps at Texas St (half-diamond to/from the east) will be removed, and the interchange at Virginia St will be reconstructed into a standard diamond, with the eastern ramps accessible to/from the bridge (but not downtown). Proposals outlined for the Mobile Bayway in 2001 called for adding the new lanes between the two roadways, and expanding the left-hand shoulder to ten feet from the current 5 foot 3 inch width. The gap between the two viaducts would reduce from 139 foot 3 inches to 73 feet overall, with the distance slightly shorter in width near the Eastern Shore. Interchanges with U.S. 90 and U.S. 98 would be reconstructed, but retain the same configuration in place today. Interstate 65 originates in Mobile at a three-wye interchange with Interstate 10. The freeway arcs northeast around MidTown Mobile to the city of Prichard with six overall lanes. Frontage roads (Belt Line Highway) accompany both directions of the freeway. Carrying two way traffic, the parallel roads serve adjacent commercial development and provide connectivity to east-west arterials and with the I-65 on and off-ramps. 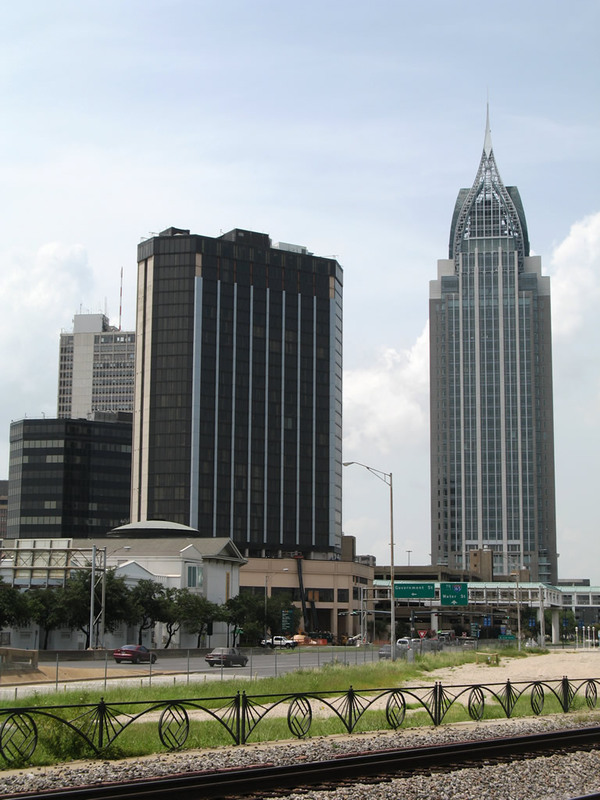 North through Prichard, Interstate 65 meets I-165, a freeway spur leading southeast to the Alabama State Docks and Downtown Mobile. The six lane freeway continues through Chickasaw to Saraland, where a parclo interchange joins I-65 with SR 158 and SR 213. SR 158 west to Schillinger Road is part of the proposed realignment of U.S. 98 west to the Mississippi state line. I-65 comprises a rural four-lane freeway from Exit 13 north to Satsuma, Creola and the high rise (Dolly Parton) bridge over the Mobile and Tensaw Rivers. Speed limits increase to 70 miles per hour on this stretch, and increasing truck traffic headed to U.S. 43 and points north led to proposed, but unfunded, expansion of the highway to six lanes north through Exit 19. A nine mile bridge system takes Interstate 65 northeast into Baldwin County. The elevated roadway spans Little Lizard Creek, Mifflin Lake and a wide area of wetlands through to a diamond interchange with Alabama 225 near Stockton. The rest of the route northeast to Montgomery slowly gains elevation through large tracts of pine forest. Interstate 165 constitutes a 4.90-mile freeway spur joining Downtown Mobile with Interstate 65 north to Saraland and Satsuma and south to U.S. 98 (Moffett Road) for West Mobile. With six overall lanes, the entire freeway elevates along a viaduct system. The route crosses a number of arterials through the city of Prichard, the Alabama State Docks railroads, and wetland areas by Conception Street/Road into Mobile. Construction of I-165 through Prichard severed a portion of the street grid. The freeway runs just east of the municipal complex and Downtown. It replaced U.S. 43 as the through route from Mobile north to Saraland, with U.S. 43 ultimately truncated from Broad and Government Streets west of Downtown Mobile to a grade separated intersection with Bay Bridge Road (U.S. 90) in Prichard. Interstate 165 arose out of a plan for a full urban loop linking I-65 in Prichard with I-10 at the Water Street interchange south of Downtown Mobile. Numbered Interstate 210 and approved by AASHTO on June 25, 1981, the proposed freeway would have run south along Water Street from the current freeway end of I-165 at Beauregard Street to meet I-10 by the west entrance to the Wallace Tunnel. Extremely high costs associated with needed right of way, coupled with social and economic impacts to the Downtown area ultimately cancelled the full build out, with Water Street constructed as a six-lane boulevard instead. According to a Mobile Register article published on April 6, 2003, the state canceled the West Mobile Bypass due to significant community opposition along the proposed route (especially in western reaches of unincorporated Mobile County), environmental concerns (endangered gopher tortoises), and the cost of conducting an environmental impact statement (EIS). Costs at the time were estimated to run around $250-300 million for the proposed 30-mile highway. Additionally all available Interstate highway funds were depleted then as well, so an Interstate designation was not planned for the route. Alabama DOT officials did not call this project dead at the time, but no significant progress on the bypass corridor has transpired since public meetings took place in spring 2002. A public hearing held on April 11, 2002 outlined the two main alternatives considered for the West Mobile Bypass freeway, the green outer loop alternative and the orange inner loop alternative. Sub-alternative options (yellow, purple and red) included variations near Mobile Regional Airport (MOB) and through north Prichard and west Saraland. Interchanges were outlined at major crossroads including Airport Boulevard, U.S. 98 (Moffett Road) and U.S. 45. The West Mobile Bypass was proposed to run north from Interstate 10 at a new interchange west of McDonald Road (CR 39) to Dawes. The corridor paralleled Snow Road (CR 25) north to Semmes, where the inner loop angled northeast to where SR 217 (Lott Road) and Schillinger Road (CR 31) meet, and the outer loop crossed U.S. 98 near Blackwell Nursery Road at Semmes. Both alternatives converged at Interstate 65, roughly near milepost 17 near Satsuma. U.S. 31 generally shadows Interstate 65 throughout the state of Alabama. The two highways separate south through Baldwin County, with I-65 crossing the Mobile and Tensaw Rivers west near Stockton, and U.S. 31 heading south from the county seat of Bay Minette along a portion of Gulf Shores Parkway with Alabama 59. Gulf Shores Parkway provides the main arterial linking I-65 and points north with Orange Beach, Gulf Shores and the South Alabama beaches. U.S. 31 separates with the parkway at Stapleton, arcing southwest to the city of Spanish Fort along a growing suburban corridor. The US highway concludes at U.S. 90, where it turns west onto Spanish Fort Boulevard to cross Mobile Bay. U.S. 31 formerly extended west along U.S. 90 & 98 (Battleship Parkway) to Blakeley Island and the Mobile city limits. Remnant signage was still posted along I-10 for the concurrency as of 1993. Historically U.S. 31 also looped north with U.S. 90 along Bay Bridge Road and south along Telegraph Road and St. Joseph Street to end west of Downtown at Broad and Government Streets. U.S. 43 travels nearly the height of Alabama, originating in Prichard and connecting the Mobile area with the Black Belt region and Tuscaloosa. Within Mobile County, U.S. 43 follows Telegraph Road and Craft Highway north along an older four-lane arterial through Chickasaw, Saraland, Satsuma and Creola. Beyond its exchange with Interstate 65, U.S. 43 transitions into a rural divided highway, serving a number of paper mills and industrial plants along the parallel Mobile and Tombigbee Rivers. The highway travels through the town of Mt. Vernon and continues north to a trumpet interchange with Steel Drive before crossing the Washington County line. Through Prichard, U.S. 43 previously traveled along Wilson Avenue to Downtown, and U.S. 45 (St. Stephens Road) along the Mobile city line. This alignment was later renumbered as U.S. 43 Alternate, with U.S. 43 shifting onto Telegraph Road to the east. AASHTO finalized the reroute of U.S. 43 wholly onto Telegraph Road from Prichard south to Beauregard Street in Mobile on October 3, 1981. Another change for U.S. 43 took place by late 2001. 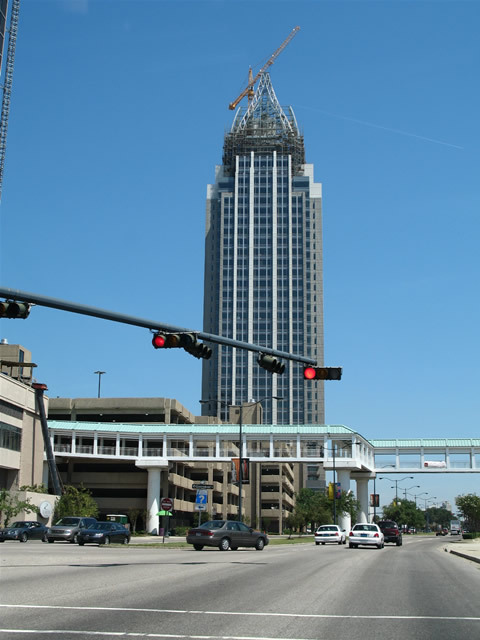 The route was truncated north from Broad and Government Streets, where U.S. 90 and 98 intersect west of Downtown Mobile, to end at the grade separated intersection with Bay Bridge Road (U.S. 90 & 98 Truck). Telegraph Road south to Beauregard was made discontinuous with the demolition of its viaduct across the Alabama State Docks Railroad. The road still serves local traffic to the state docks via Dekle Street. U.S. 45 originally began at the intersection of Broad and Government Streets along side both U.S. 31 and U.S. 43. The route turned west, 0.33 miles north of U.S. 90 (Government Street), to overlap with U.S. 98 along Spring Hill Avenue for 0.59 miles to St. Stephens Road. U.S. 45 was truncated northward to the five point intersection with U.S. 98 (Spring Hill Avenue) and Ann Street by 1999. St. Stephens Road angles northwest through the Allenville community of Mobile as a three-lane boulevard. Crossing the Prichard city line at Prichard Avenue, U.S. 45 advances northwest to a six-ramp parclo interchange with Interstate 65. Commercial frontage lines the four-lane arterial through to Eight Mile and SR 213 (Shelton Beach Road). U.S. 45 transitions into a rural two-lane highway north to a diamond interchange with SR 158 (Industrial Parkway) and Kushla through northern reaches of Prichard. Beyond the city line, U.S. 45 continues to the rural settlements of Chunchula and Gulfcrest. Citronelle, a city of nearly 4,000, lies at the north end of Mobile County along U.S. 45. There the US highway widens to a three lane commercial boulevard along 3rd Street. Totaling 59.18 miles in Alabama, U.S. 45 winds through rural Washington County to cross the Mississippi border by the town of State Line. U.S. 45 expands into a four lane highway with expressway like qualities from Mississippi 57 north to Meridian. U.S. 90 parallels the Interstate 10 corridor across southern Mobile County from Grand Bay to the Cochrane-Africatown Bridge across the Mobile River. The highway is generally rural as it travels east from a short overlap with SR 188 at Grand Bay to the communities of St. Elmo and Irvington. Turning north through Theodore, U.S. 90 expands into a four-lane commercial arterial. It crosses paths with Interstate 10 at a six-ramp parclo interchange at Tillmans Corner and meets the north end of SR 193 nearby. Continuing into the Mobile city limits, U.S. 90 remains a divided commercial arterial, following Government Boulevard northeast to a six-ramp parclo interchange with Interstate 65. Service roads line portions of U.S. 90 northward to Eslava Creek, where Government Boulevard becomes Government Street. The arterial narrows to a four-lane urban boulevard ahead of SR 163 (Dauphin Island Parkway) south. Mature cypress and live oak trees line U.S. 90 (Government Street) east through Midtown Mobile. U.S. 90 parts ways with Government Street at Broad Street, which dually carries U.S. 90 east and U.S. 98 west northward to Spring Hill Avenue. With left-hand turns prohibited from Government Street east at Broad Street, the mainline movement of U.S. 90 utilizes the block of Jefferson Street south and Church Street west to connect with Broad Street north. 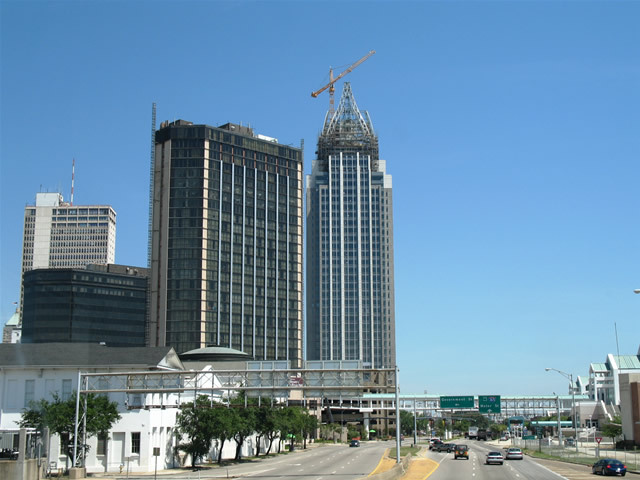 U.S. 90 circumvents Downtown Mobile along Broad Street north to Dr. Martin Luther King, Jr. Avenue and Beauregard Street east to Water Street and the south end of Interstate 165. 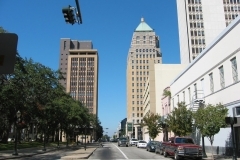 The six-lane boulevard is part of the Henry Aaron Loop encircling the Mobile central business district along with Canal and Water Streets. Interstate 165 leads U.S. 90 and U.S. 98 Truck north 2.55 miles to a diamond interchange with Bay Bridge Road in Prichard. The two US highways turn east there along a four-lane arterial to the Magazine industrial area, where they elevate to cross the Mobile River along the Cochrane-Africatown USA Bridge. The four-lane cable-stayed span opened to traffic in 1991. Curving south on Blakeley Island, U.S. 90 (Cochrane Causeway) reconvenes with U.S. 98 at the east entrance to the Bankhead Tunnel. 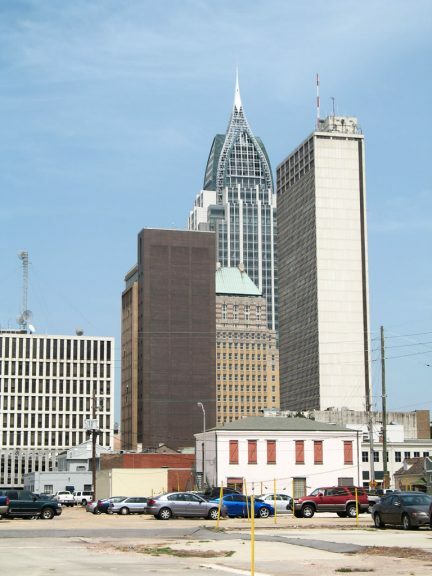 Prior to 1999, U.S. 90 through Mobile remained along Government Street, overlapping with U.S. 98 through Downtown to the Bankhead Tunnel. Sign changes appearing at that time reflected the realignment of the route in place of U.S. 90 Truck along the loop north to Prichard and east across the Cochrane Bridge. An application to AASHTO approved on October 11, 2002 referenced the slight alignment change for U.S. 90 along Bay Bridge Road, where a new overpass was constructed over Telegraph Road. U.S. 90 & 98 combine for the second time along Battleship Parkway east to the city of Spanish Fort. The four-lane causeway crosses northern reaches of Mobile Bay with two interchanges connecting to Interstate 10 (Mobile Bayway). The 6.94 mile overlap concludes at a wye interchange just east of the Blakeley River. U.S. 98 travels 80 miles east from Interstate 59 in Hattiesburg, Mississippi as a four lane expressway to the Alabama state line. The US route immediately downgrades to two lanes at the Escatawpa River, where an unused span awaits completion of four laning in Mobile County. U.S. 98 (Moffett Road) winds southeast through the rural community of Wilmer and across northern reaches of Big Creek Lake to Fairview. East of Snow Road (Mobile County 25), Moffett Road enters the city of Semmes and expands into a five-lane boulevard. Heading southeast to the commercialized intersection with Schillinger Road (Mobile County 31), traffic increases as commuters join regional truck traffic leading into the city of Mobile. Moffett Road once earned the nickname “Bloody 98” due to a high frequency of accidents and automobile fatalities. This was especially the case prior to 1980s expansion of U.S. 98 from a two lane road.5 The five-lane arterial otherwise lowers from Wolf Ridge Road to meet Interstate 65 at a folded diamond interchange opposite the CN Railroad. U.S. 98 shifts onto Spring Hill Avenue at the east end of Moffett Road, 0.6 miles from I-65 and its companion frontage roads (Beltline Highway). Springhill Avenue continues U.S. 98 east through Park Place, Mobile Infirmary hospital and the Lyons Park community. Approaching Downtown, U.S. 98 turns south along Broad Street, with eastbound overlapping with U.S. 90 westbound and vice versa. The short overlap was once the location of five U.S. highways, with U.S. 31, U.S. 43 and U.S. 45 running in tandem to a joint terminus at Broad and Government Streets. Government Street leads U.S. 90 west to Midtown Mobile while U.S. 98 lines the four-lane, tree lined boulevard to Downtown and Mobile Government Plaza. Beyond Conception Street, U.S. 98 narrows to two lanes and lowers into the Bankhead Tunnel. The Mobile River crossing opened to traffic as a toll facility on February 20, 1941. East into Spanish Fort, U.S. 98 separates with U.S. 90 along a short expressway along the bluff line east of the Blakeley River. U.S. 98 meets U.S. 90 again at their exchange with Interstate 10 at the east end of the Mobile Bayway. The two part ways on the south side of the interchange, with U.S. 90 continuing east to Malbis and U.S. 98 expanding into a five-lane, divided arterial south into Daphne. U.S. 98 represents the main commuter route for the Eastern Shore communities of Daphne, Montrose and Fairhope. U.S. 98 Alternate, shielded mostly as Scenic Baldwin County 98, branches southwest from U.S. 98 to Downtown Fairhope, Battles Wharf and Point Clear. Straddling coastal areas of Mobile Bay, the alternate route was the original alignment of U.S. 98 established in 1955. U.S. 98 shifted east to its linear alignment north from Barnwell to Spanish Fort in stages. The first relocation was approved by AASHTO on October 26, 1969, with U.S. 98 shifting onto the new facility north from SR 104. The succeeding section south from SR 104 opened a decade later, with approval by AASHTO on October 3, 1981. A four part project was proposed to realign U.S. 98 north from Mobile, Semmes, Big Creek Lake and Wilmer. The first two stages of construction, completed in 2008, expanded SR 158 (Industrial Parkway) to four lanes and extended the highway west from a new diamond interchange with U.S. 45 to Mobile County 31 (Schillinger Road). Subsequent stages, originally anticipated for completion by 2010, include the Semmes and Wilmer Bypasses. Initial grading for the Wilmer Bypass was completed by 2009. This work followed years of litigation and environmental study. Mobile Area Water System (MAWS) officials argued against the proposed design for the Wilmer Bypass, citing that the new alignment should be built as a limited access highway to offset possible pollutants affecting Big Creek Lake from water runoff from potential development along the highway. Work halted by 2010, and the right of way and grading remained unused through to 2018 due lack of funding. 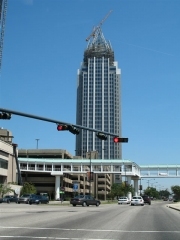 Overview and photos of major arterials and streets in Mobile, Alabama lettered from A to J.
Overview and photos of major arterials and streets in Mobile, Alabama lettered from K to W.
RSA Battle House Tower, owned by the Retirement Systems of Alabama (RSA), was constructed between 2004 and 2006 along Water Street in Downtown Mobile. 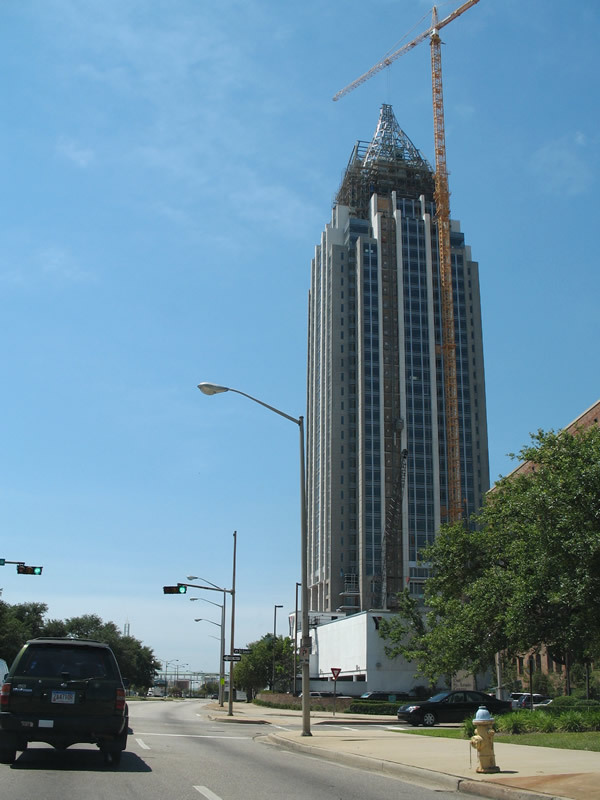 The high-rise overtook Wachovia Tower in Birmingham as the tallest building in Alabama. 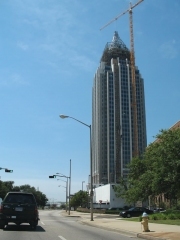 Costing $162 million, the skyscraper rises to 745 feet with 35 floors. “I-165 now open Route connecting downtown with I-65 in Prichard saves motorists 9 minutes in travel time.” Mobile Register (AL), October 29, 1994. “No street lights yet on Interstate 165.” Mobile Register (AL), November 2, 1994. “I-165 delay said nothing about politics.” Mobile Register (AL), October 29, 1994. C-Ro, email: “About Mobile,” May 28, 2004. Alphonso Mason, email: “Mobile City Guide Section of SouthEastRoads: Contributions.” June 27, 2006. Page Updated July 11, 2017.